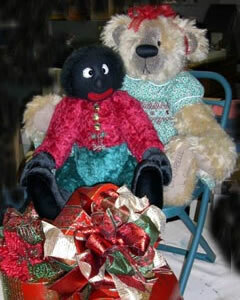 When Jan Cuming decided to start making bears, she combined her love of Christmas and teddy bears to come up with her company name, ‘Jinglebears’. Since Jan had always enjoyed making things, what out started as collecting, soon turned into a full-blown business. She purchased her first piece of mohair at a show along with a commercial pattern, made the first bear, decided she could improve on it, and as they say, “The rest is history”. She still has the first bear she ever made. Although he was a little odd looking, she called him Albert George, after one of her grandfathers who was apparently quite a character also. teddy bear shows, travels extensively with her “adopted” American family, who are friends that have become like family over the years. Together they travel around, shopping for antiques and other bits and pieces to put into the vignettes that Jan is best known for. Always on the lookout for vanity cases, she hunts for accessories by going to auctions, antique malls, flea markets and occasionally scouting on eBay. for wanting special clothes that she liked led her to discover her talents in sewing. She made most of her own clothing at the early age of fourteen. Jan also dabbled in embroidery, cross-stitch, knitting, rug making and quilting. “I had a lot of encouragement from my Mum. That’s ‘Mom’ to you,” Jan teases. Her mother, Moya Weaver, has also embraced the bear industry. She creates and sews the smocked dresses, tailored suits and hand knits brightly colored teddy bear sweaters from soft New Zealand wool. Jan displays the sweaters at the shows too. “The cardigan sweaters often fit dolls too,” she said. Jinglebears has been going strong for 12 years. 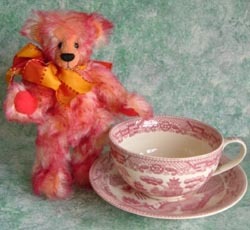 Her table displays are lavish, with elaborate bows embellishing almost every teddy bear and rabbit. Many of her bears are part of vignettes with intricate antique pieces that tell a story with their expressions and variety of accessories. 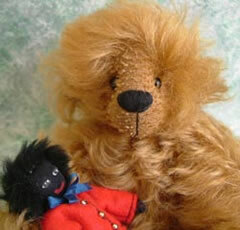 “Antique collectors love seeing all my finds tucked around the bears,” remarks Jan. We do too! Frederick, shown on the left, is ready to travel with all his vintage accessories in a round, leather suitcase. Alex lives in an old shoe but knows what to do! He wears a warm hand knit scarf, and made a snowman! 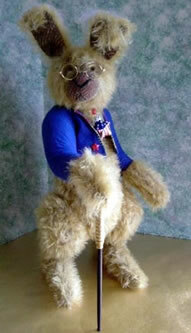 Mr. Wiggley is quite a dapper dan with his eyeglasses and walking stick. 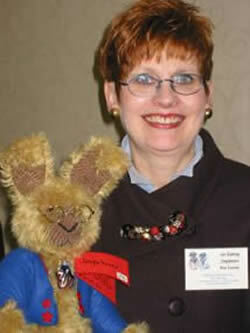 Jan designed a bear to ride on a vintage stuffed horse for the next Derby race. Racing accessories are included. Cilla is a small bear who hugs a toy elephant. This ol' chap named "Chappy" was a commissioned piece. He represents the owners Grandfather who was a cub reporter, a political reporter and a publisher of the Organ Voter. 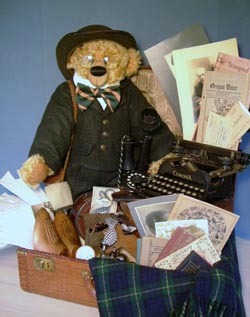 Included in the vignette, are original and photo copied newspaper articles, photographs of Chappy as a young man, a real typewriter, scissors, a leather box filled with starched collars, press passes, an extra pair of socks, a package of two starched shirts from the laundry, a man's hat box, lap robe, old time phone, shoe stretchers, sterling clothes brush, a can of palmade, extra bow ties, books, tickets from the 1900 Republican and Democratic National Conventions, a mechanical pencil over his ear, and over his shoulder a pair binoculars, and wears Chappy's original bowler hat. Large bear wearing a holly print smocked dress holds a Golly on her lap. Through digital magic Jan's bear and Golly found their way into a snow globe and on the front cover of December's Bears&Buds Webzine!